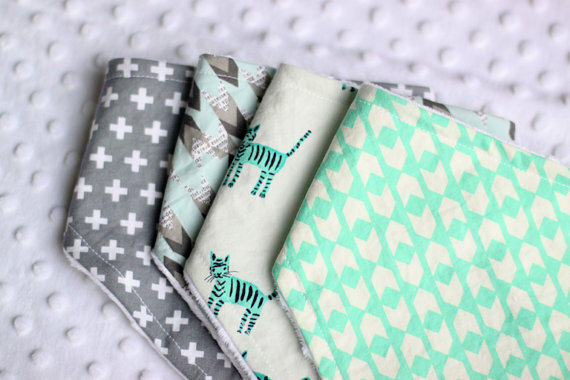 This week's Shop Spotlight is on Guguberry, one of my favorite shops for modern baby and child accessories, and owned by a dear friend of mine -- beautiful Mama of 5, Keri. With a wide variety of bibs and scarves in sophisticated and trendy patterns, there is sure to be one you can't resist picking up. I'm pretty sure I would buy every single bib set if I could, because Keri styles them together so well and they are not only high quality but so cozy, Olivia doesn't even realize she's wearing them! I've had the privilege of getting to know Keri over the past six months and Olivia has been using her products since early 2014. 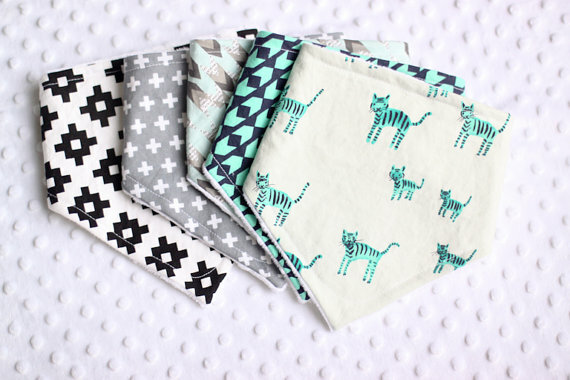 From the moment I came across her shop on Etsy back in March, her gorgeous bandana bibs caught my eye and it seems every week she is releasing beautiful new patterns and pieces for both boys and girls. There are so many things I love about Guguberry, but my favorite is the wide selection of fabrics. Babies and toddlers drool a lot, and it's important for moms to have products they can put on their babes that not only protect their clothing and skin from drool but are still comfortable and functional. Guguberry offers bandana bibs, single wrap infinity scarfs, double wrap infinity scarves, and my new favorite -- infinity scarves with a snap in the back. They are easy to put on, easy to take off, and look just like a stylish scarf but serve a purpose as well. 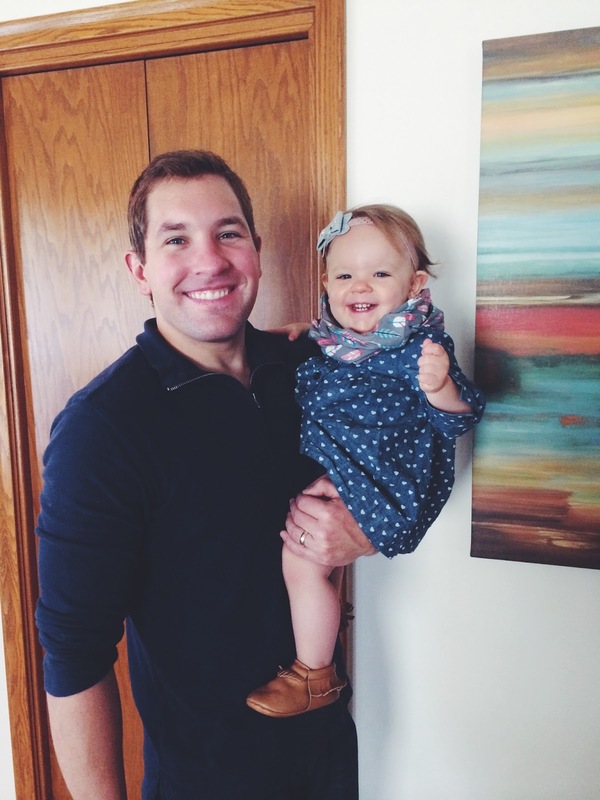 A win-win for busy moms and teething babies! "I started my business in April 2011. It began because I just wanted to sew something, so I bought a basic pattern from Hobby Lobby of a traditional style baby bib. I also made a few felt and fabric headbands. At the time, I didn't even know what Etsy was! But my husband created an account for me and came up with my logo, name and business cards. You can see who the creative one in our family is!" "My shop name -- Guguberry -- is Zulu for "precious." As you can imagine, it seems like every name under the sun is already taken, but once you get a little creative (my husband again, not me), we found and liked how Guguberry sounded and LOVED the meaning behind it; we believe each life is so precious and has a purpose in this world. I actually came home from book club one evening to find a whole list of names my husband had come up with for me to look through. He is such a sweet guy!" 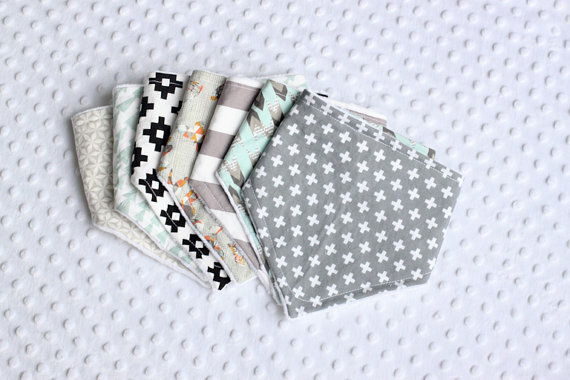 "Of course, I'm most inspired by cute babies but also by beautiful fabric. There isn't one product I love creating more than another -- I honestly love them all. 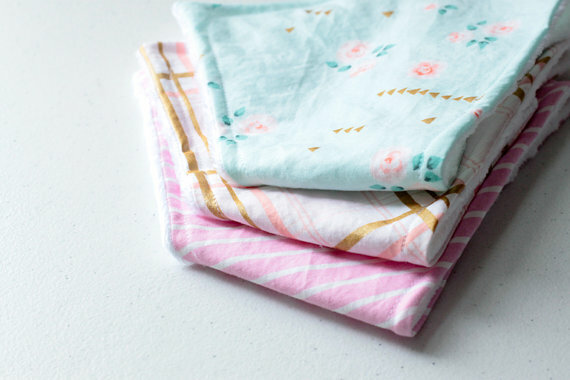 I love getting a new fabric print in the mail and seeing it turn into a darling bibdana or drooler scarf." "The most challenging part of running my own business is trying to find time. I could sew 24/7 and it still wouldn't be enough. The never ending battle of knowing when to not be sewing and focus on my family can sometimes be difficult. I often feel exhausted in the evening and debate whether I should stay up late working or go to bed to get a good night of sleep. Balancing those choices is my biggest challenge right now. But I find it so rewarding to see the finished products and to know they are going to babies all over the world. That's a pretty amazing thing." "The best part overall is hearing back from customers and knowing you are meeting a need with the products you are creating. It's so fulfilling to know that other moms are happy using items that you spend so much time making and laboring over, trying to make sure they are as perfect as can be. Another part I've loved is just getting connected to the community of handmade. It's very cool." "As far as my personal life, I used to be so embarrassed to admit that I didn't go to college. I graduated from high school and then a month later married my high school sweetheart. He is two years older than me and was in college already; I used to think I was "less than" for not continuing my education, but now I look back and am so glad I didn't go to school, knowing I would have spent a lot of money without being sure if it was worth it. In my heart, I've always wanted to be a wife and mom, and stay home to raise my children. I know that is exactly what I have been called to do! I do think college is wonderful and hope all my children attend, but I will also be sensitive to their choices after high school if they choose something else." "Finally, I've been married for 13 years now and I just love that my husband and I grew up together. Having five children, there is always a little chaos with everything we do, but it's a wonderful chaos. Our children are Aidan (11), Elizabeth (9), Grayson (7), Emma (4) and Ethan (1.5). They are a joy and I'm so glad we get to be their parents, even on the most challenging days (which we have many of right now)!" "Outside my business, my life is very busy with just trying to maintain some order in our home with laundry, dishes, toys, and it seems there are always crumbs everywhere. I love to read and enjoy a cup of coffee in the afternoon when its quiet and my youngest are sleeping. I love meeting friends at Panera Bread to have a caramel latte and share our hearts. My favorite movies are Narnia, Pride and Prejudice and Dan in Real Life. If I could, I'd love to just sit at the beach all day and read. I'm a terrible cook and I so wish I was better at it, but my husband and I get to have a date night on Friday when my mother in law comes to spend time with our kids and in so many ways it is a huge blessing that we don't take for granted!" my favorite products || this mauve polka dot scarf is my absolute favorite piece in the whole shop // this vibrant floral bib as well as this one // this agave field drool scarf // this arrow aqua bandana bib [a perfect gender neutral piece] // & finally this tiger stripes in blue bandana bib [above] that I will buy someday when I have a little boy! quality + craftsmanship || Keri has perfected her products top to bottom and I absolutely love how well made they are. When something arrives from her shop in the mail, I know I am getting the best of the best. The materials she uses and the way she executes her design makes for high quality products that I not only love to put on Olivia but would be equally as proud to give as a gift to a new Mama. overall opinion || From the moment I discovered Guguberry months ago, I have been nothing short of impressed with both Keri and her wonderful shop + products. Her selection of products is out of this world, her fabric choices are phenomenal and her customer service is top notch. Beyond that, she is one of the kindest people I've ever met and I am so blessed to call her such a sweet friend. I also love that her prices are so affordable for the quality you are receiving. value + recommendation || Through all the bibs and scarves we've had, I've never had an issue with a snap breaking, a seam coming undone, nothing. And believe me -- Olivia isn't always just a little lady that sits and sips tea (surprising, right?) -- she can get down with the best of 'em and sometimes this means the quality of what she wears gets tested to the limits. Fortunately, everything has stood up perfectly, even wear after wear and wash after wash. I also think it's so special to give gifts that are handmade for Moms to Be or New Mamas, and one of these bibdanas or drooler scarves would be the perfect final touch to a thoughtful gift. giveaway || Keri is so generously giving away a $30 shop credit to Guguberry to put toward any products of your choice. To enter, simply complete the steps below in the Rafflecopter. Giveaway is open to residents in US and Canada and will run from Monday, September 15 through Sunday, September 21. All entries will be verified and the winner is responsible for contacting A Blessed Nest within 24 hours of being announced. Happy Monday! I would choose the grey floral bibdana and the tomahawk Arizona bibdana. And one of the baby drool scarfs not sure which one! I would choose the gray arrows bibdana and the Aztec print one! So cute! They're all so cute!! It's so hard to choose, but I love the baby infinity scarves! The infinity scarves are adorable!! I need to get some for Ellie!!! Not to mention V is so cute and looks great in them! I'm wondering if you would like to guest post for my Toddler Tuesday series?! I Love the infinity scarves and the headbands, can never have enough of either. Also great read thanks for sharing! Loving your blog! Definitely an infinity scarf! I love the mustard and lace one best. Thanks for the opportunity! Probably the native looking girl bibdana set! It has dream catchers, feathers, and gold chevron! Soooo cute!!! the gold chevron bibdana would for sure be a staple for juliette joy… she wears gold almost daily and, unlike the other ugly bibs i refuse to use to catch her drool, i would for sure use this both functionally and as an accessory. 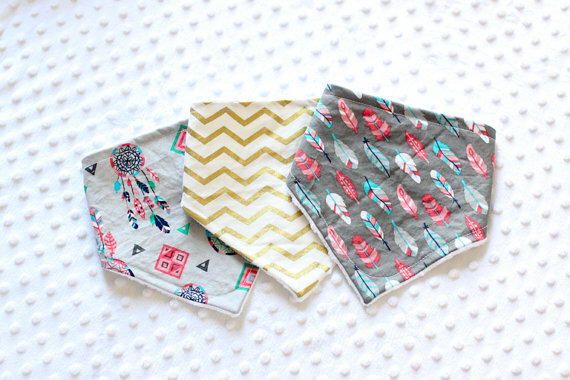 I would get 2 bandana bibs- one with the feathers and the bright floral one. And I'd probably get the white floral infinity scarf too!